Nicholas Hill. Because this is the kind of man you want as your contemporary source when you’re repeating 300-year-old, fourth-hand innuendo. Click to see an enlargement. Opens in a new tab. Far different however was the course run by Nicholas Hill, formerly Fellow of St. John’s, and which about this time ended in death in a foreign land. Conscious of possessing great and shining abilities, he affected to rise above the common mode of thinking and acting. This led him into many visionary schemes of philosophy and many eccentricities of behaviour. And to this we are to attribute his attachment to some profligate wits, who unfortunately admired his humour and flattered him in his conceit. Renouncing the rational religion in which he had been educated, he embraced the absurdities of the Epicurean System, and fell from folly to folly, till at last he lapsed into the faith of a church that claims to be infallible, as a resting place from his errours. Nicholas Hill, a native of the city of London, was educated in grammaticals in Merchant-Taylors’ School, in academicals in St. John’s Coll. of which he became a scholar in 1587, and in that of his age 17. In 1592, he took a degree in arts, being then fellow of that house, left it before he proceeded in that faculty, and applying himself to the study of the Lullian doctrine, became most eminent in it. About that time he was a great favourite of Edward, the poetical and prodigal Earl of Oxford, spent some time with him, while he consumed his estate beyond the sea and at home. After that Count’s death, or rather before, he was taken into the retinue of that most noble and generous person Henry, Earl of Northumberland, with whom he continued for some time in great esteem. At length, being suspected to comply with certain traytors against King James I, fled beyond the seas, and there died. 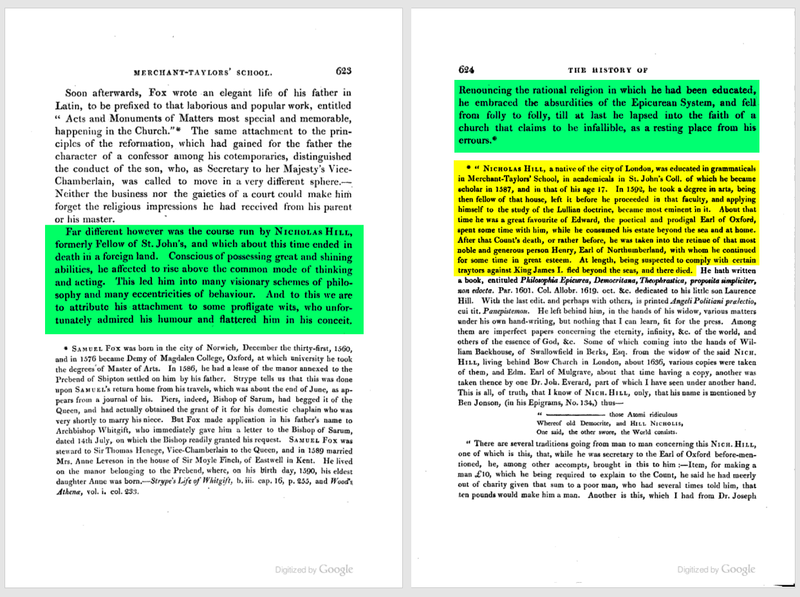 The poor attempt at chronology in the yellow highlight doesn’t even make sense. It’s another false imputation that Hill travelled with me in Europe. When I went to the Continent in 1575, Nicholas Hill was five years old – an age insufficient even to attend the institution which later considered him one of its ‘principal scholars’. Hill was included in this history of his alma mater, Merchant-Taylors’ School, as shown above. Published in 1812, it was written by the Rev. H. B. Wilson, B. D., Second Under-Master, whose bias is obvious and whose narrative skills leave much to be desired. (Although he did call me poetical as well as prodigal, so at least there’s that.) I hope that the school employs more competent faculty members these days. If you want to know more about Hill’s ‘being suspected to comply with certain traytors against King James I’, see my description of this plot and its main character, Robert Basset. The rest of what matters about Hill is in the A Lot of Hot Air post that you presumably came from to read this.